I actually found this little guy a week ago while doing a noble job for a church here in town. 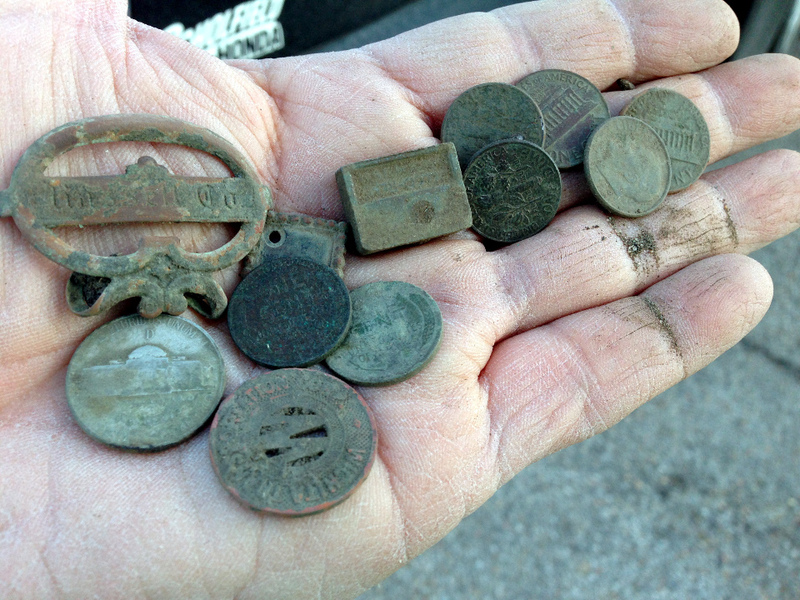 The Wheat State Treasure Hunters metal detecting club met at a local church to do a bit of community service and help them locate some lost items. 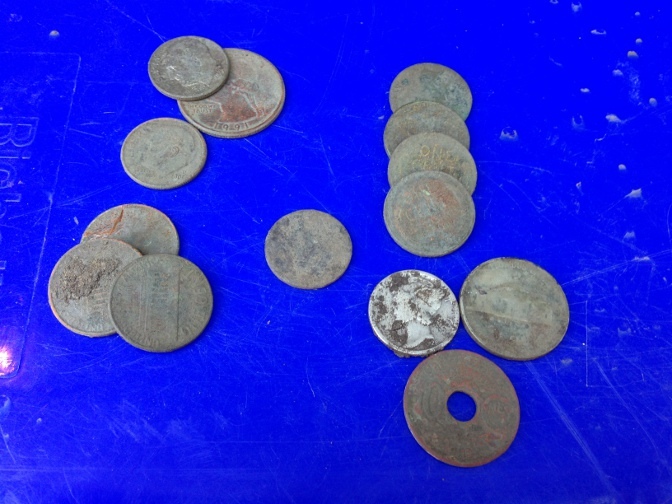 They kindly told us we could keep all the coins we found and I think by the end of the day, 8 or 9 silver coins were found by various club members. 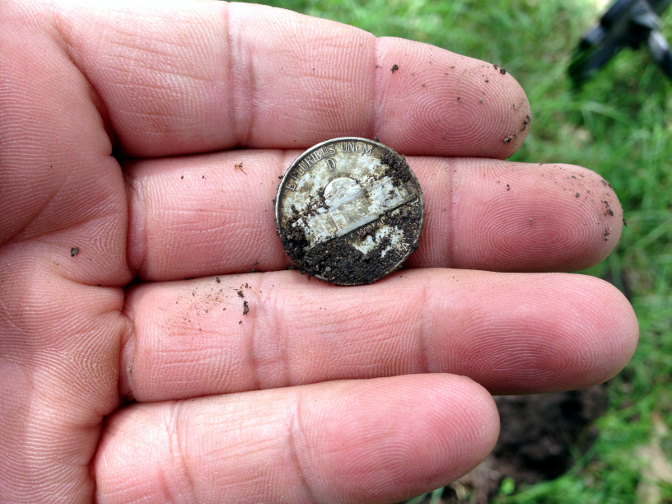 For me, it had been a while since I found my last silver coin. 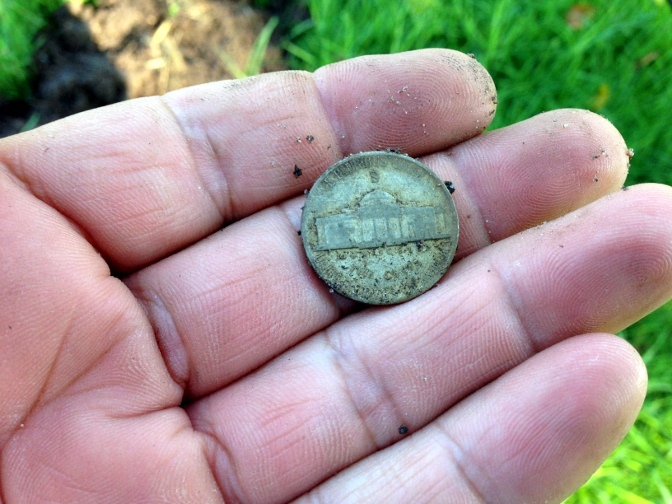 I can’t even take a whole lot of credit for finding this coin with Maurice as I saw it before I ran the coil over it. 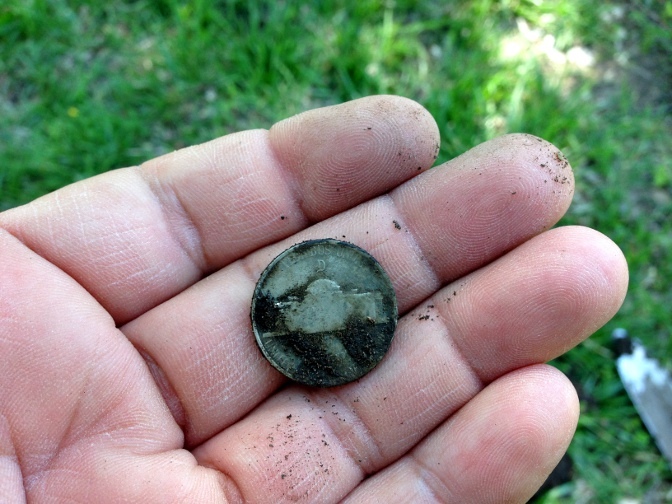 The 1943 War Nickel was laying all naked and pretty at the foot of a very old tree, obviously washed out by the rain. 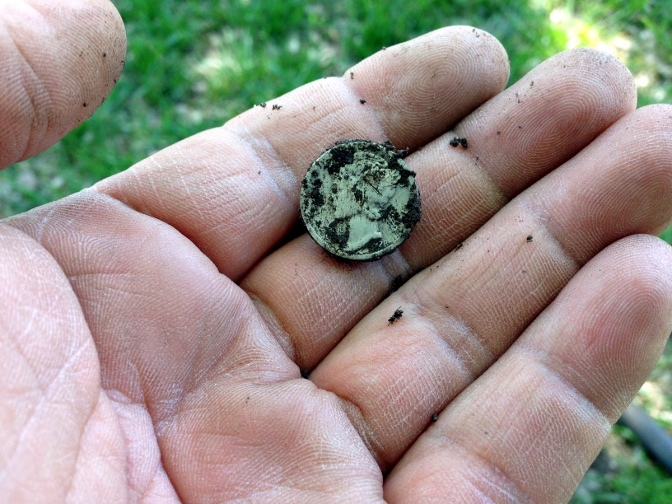 Be that as it may, finding this coin got me all excited about metal detecting again, so hopefully there will be more of these in the future. The weather finally turned enough to dust off Maurice, my XP Deus metal detector, and head to my favorite deep silver park. At the very end of 2014 I added depth to my hunts by increasing the sensitivity and lowering the speed. 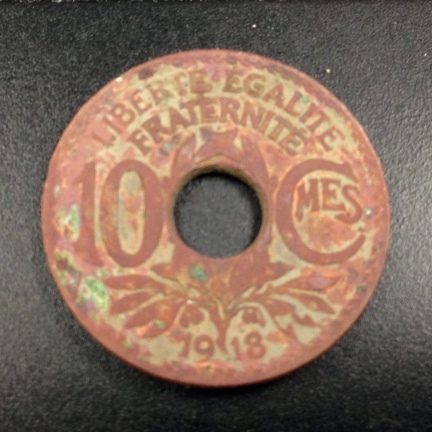 Also, I learned about a phenomenon that probably kept from finding some deep old coins in the past. With those two things in mind, I returned to a spot that I cleaned in preparation for the Blisstool v6 later this Spring (fingers crossed). I was thinking I would dig some old iron as I was sure that I had done a fairly good job cleaning all signals. Boy was I wrong! First I found a bunch of pull tabs, beaver tails, and tiny foil. I was somewhat shocked. Upping the sensitivity got me a bunch of those super small pieces of aluminum. Eventually I hit a nice repeatable deeeeep signal. At past 10 inches deep I found what looks to be a brass accent for a purse or something. It says Russell Co. in old english gothic font. Then I got a fairly loud signal that according to the target I.D was a coin. Instead I found a square electrical doo hickie that says Delco REMY on it. I was shocked that I missed this before. Some clad followed. Crazy! Then I hit a 1945 wheat. Really?? It was the next target that floored me. A 1944 D war nickel. By then I had dug almost 20 targets between trash and the non-ferrous stuff. The spot was supposed to be clean!! But I wasn’t done yet; next I found a transportation token from the 60’s. 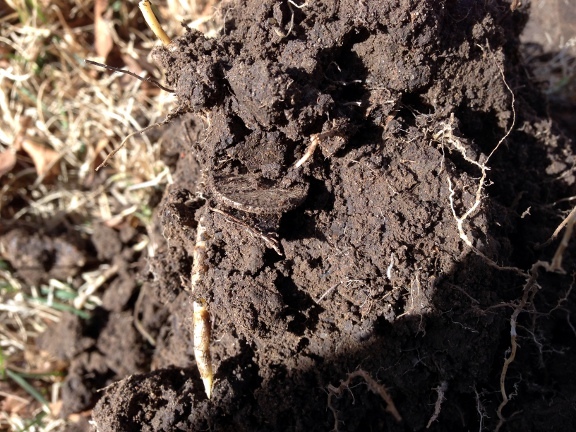 The last target I dug was a 1940 wheat. Was I hunting on deaf mode before?! I swear the spot was clean! I thought I had dug all obvious targets. I am still reeling from this hunt. Well I can’t wait to go back to this spot. I will have to re-grid it now. I went out for just a few minutes during my lunch hour and hit a park I’ve been working with the Deus metal detector. This park has a long history and at one point, thousands of people came to it every Summer, to swim in the swimming hole (later a municipal swimming pool) nearby. The site is HEAVILY contaminated with iron and I have been targeting the very deep stuff. 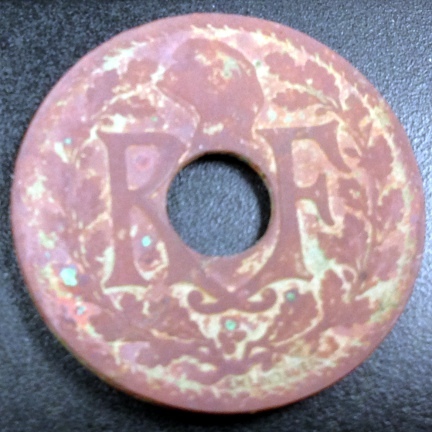 This nickel was eight inches down and it came in as an iffy iron wrap-around signal. 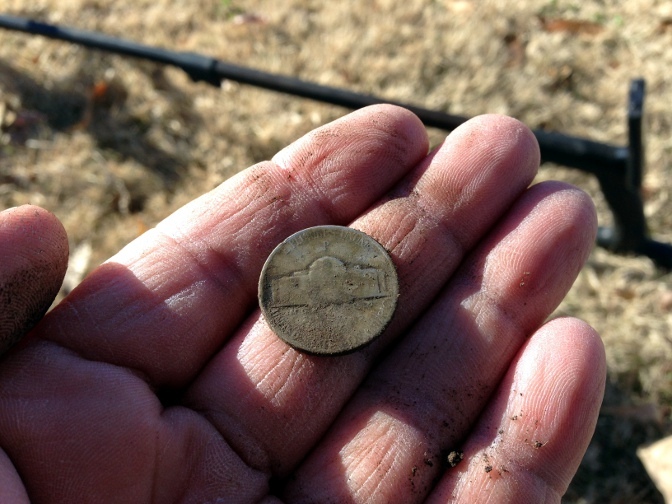 It’s a 1945 D.
I stopped by my deep silver park this morning to give my XP Deus metal detector a workout. 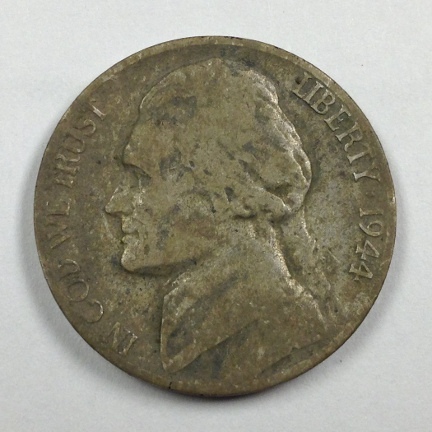 I spent about one hour and after digging a number of old milk bottle foil caps, I hit on my 5th war nickel for the year; 1945 S.
This beauty came out of the same spot that has yielded about 10 silvers and about 50 wheats plus a number of kid related relics. It seems to be a never ending sweet spot. As you may know, I had a bit of trouble figuring out the new upgrade to the XP Deus metal detector I own. However, I stuck to my guns and finally got the beast tamed. 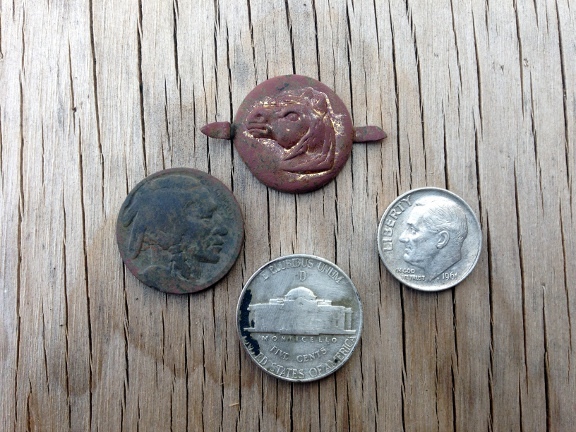 I’ve been out a couple of times since then and found a couple of Buffalo nickels and a few odds and ends but no silver. This makes silver coin number 40 for the year. It sure has been a hard road to number 40. I am way off my pace for 100 silver coins this year. I am 16 coins behind to be exact. The upgrade really set me back but now I think I can catch up. 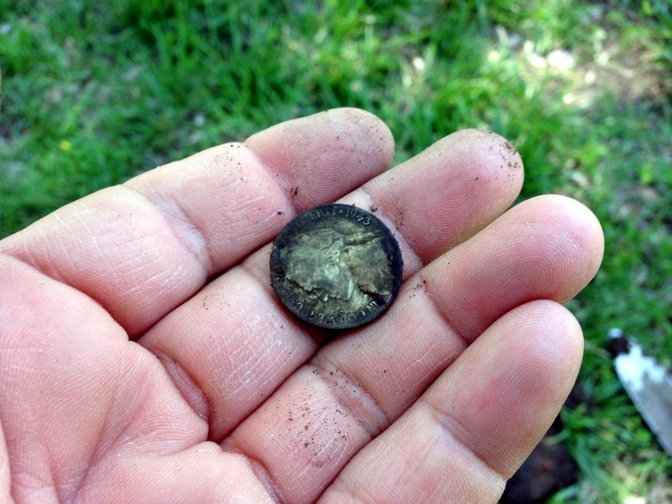 The damage to the coin was there already, provided I am sure, by a lawnmower of days gone by. The XP Deus Is King! Today for lunch, I returned to the park where yesterday I found a Roosevelt dime. 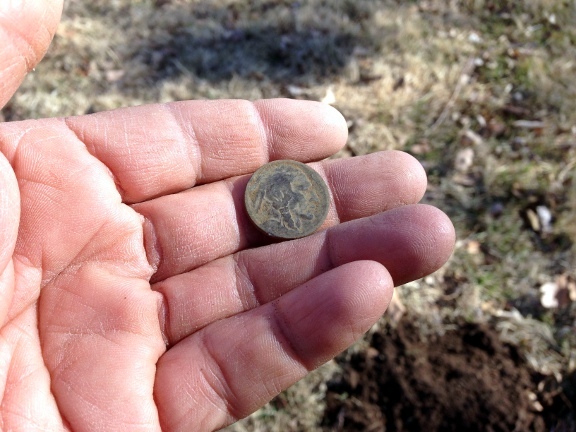 When I got there, I remembered that there was a spot where I found an Indian Head cent almost exactly one year ago. At that spot, there was a house back in the day and I thought I had the front yard and the back yard all figured out. 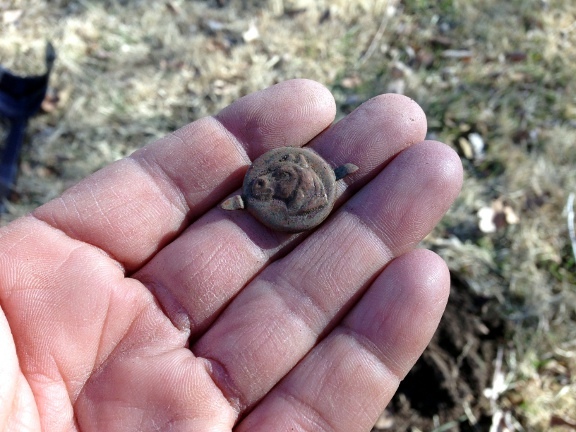 After I found the Indian Head, I gridded the area carefully with the AT Pro and found nothing else. Later in the year, I returned to the same spot with my White’s V3i and again, found nothing more. 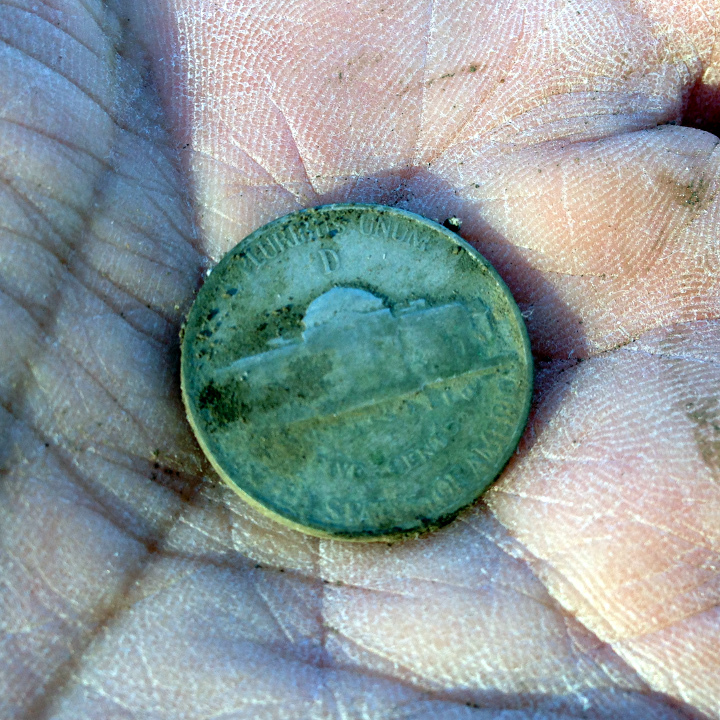 A 1943 D war nickel at about 6.5 inches deep. Incredible. I just cannot believe it. I missed all these coins (by then I had four wheats in my pocket) with the Pro and the V3i. But not with the Deus! 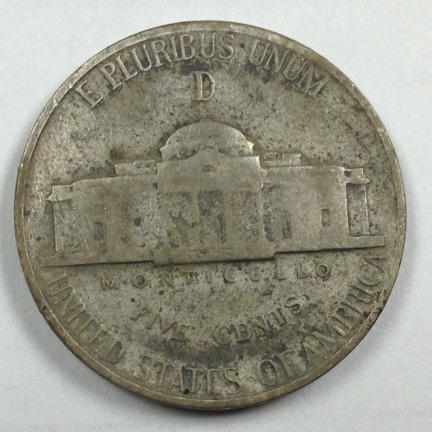 This coin was first minted in 1917 and was last minted in 1938. A cool coin of a common date. I always wonder how coins like this come to be in our fair city. 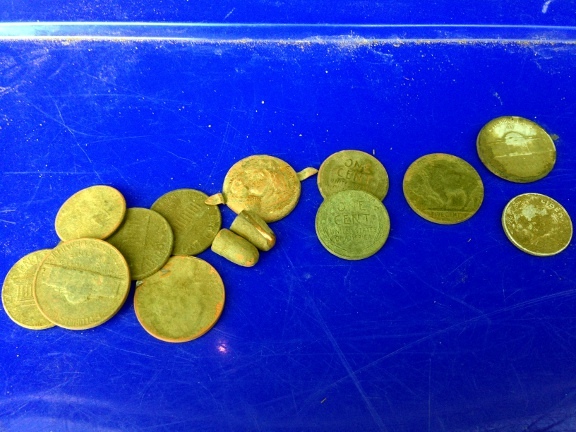 So at the end, I ended up with a number of coins that I COMPLETELY missed with my other detectors. This is why I am having to re-hunt every spot with Maurice. I went out today with my Deus metal detector and with the express goal of ending my two week silver slump. 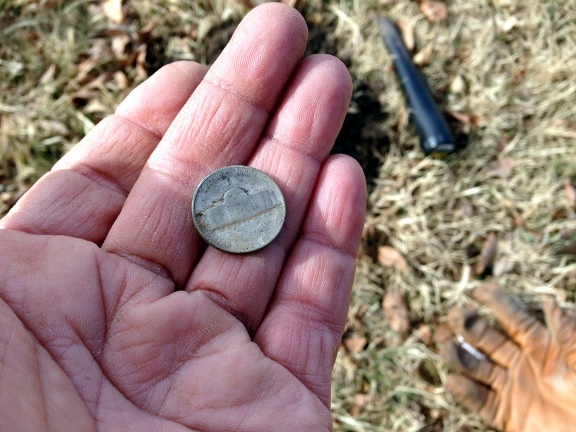 The first target worth mentioning was a cool Buffalo Nickel with no visible date. I love finding these. I didn’t keep count of them last year but I will this year. Before I covered the hole, I stuck the pinpointer in to check for additional targets and I got another hit. I was hoping for a silver coin but what I got was pretty cool too. I feel bad for the little boy who lost both his nickel and his cool pony badge. After I cleaned it, it still had some of the golden gild on it. After a little while I got a sweet signal mixed with mid tones with a jumpy VDI. I almost didn’t dig it but the sweet part of the signal convinced me to go for it and I am glad I did! 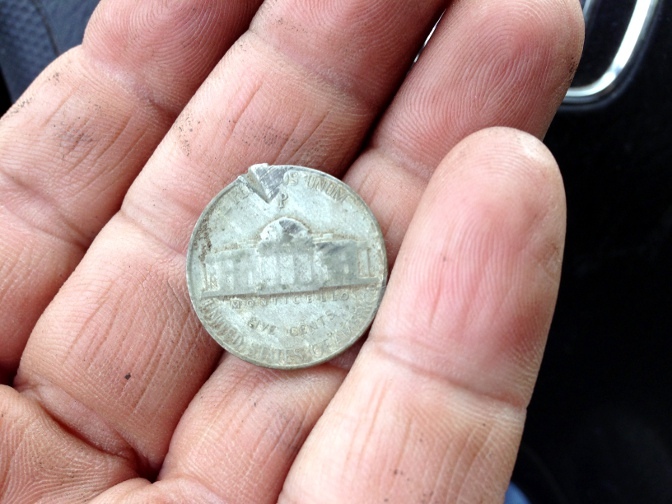 Had I kept on walking, I would have missed a 1943 war nickel. A few minutes later, in a section I’ve hit many, many times before. I got a strong dime signal. Expecting a clad dime, I got a 1961 Rosie instead, only about five inches deep. I sure do love to see that dirty silver disc poking through the dirt! It’s unusual for silver coins to be this shallow at this park and I sure don’t understand how it is I missed it before. Not too bad for a 2.5 hour hunt. Not pictured here are the pulltabs (I was looking for gold as well) and the wine screw caps that sound ever so sweet when they are deep. At lunch time, I took Maurice, my Deus metal detector, to my deep silver park. I am convinced that most of the 100 coins I’ve decided to find this year will come from this park. If you have read my blog for a while, you already know about the deep silver park. For some reason, the soil at this park is severely unstable and things sink very deep very fast. Also, recently, I discovered that Maurice reads some of these deep coins but barely makes a peep when it does. 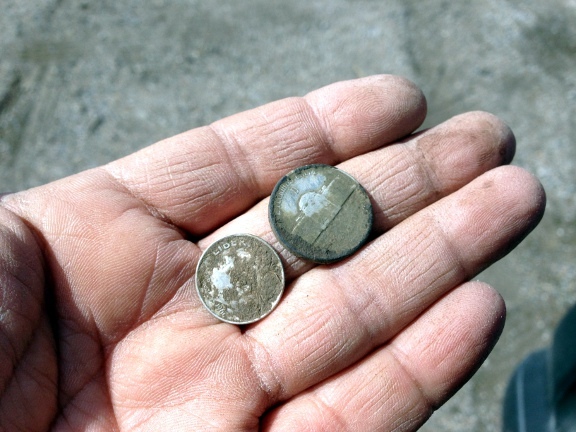 To make matters worse, when Maurice finds a deep coin –7 to 9 inches deep, it gives a VDI of 98, which normally indicates iron wrap-around. By the way, the reason why it’s called iron wrap-around is because the VDI scale is actually a wheel. This wheel starts at 00 which is iron and moves up from there to 99. As you know, high conductive targets such as silver and copper, read from the high 80’s (mid-80’s sometimes) to the mid 90’s. The iron wrap around thing happens when the detector detects rusty iron and it assigns a VDI of 98-99 which, in the wheel, is right next to 00. Get it? Well, enough theory for now. So, Maurice tells me with a faint and sometimes fuzzy high tone that there is something down deep. Then it assigns a VDI of 98 to the thing. Sometimes there is no VDI. As long as the signal is repeatable I dig it. 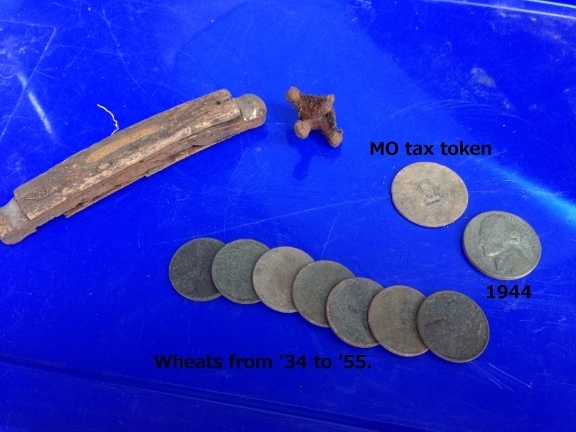 Until today, I had not dug a coin with this signal but today I dug nine and a tax token (one wheat didn’t make it in the picture). I also dug up some rusty iron items and, as always, trash. All objects dug were in the seven to nine inch depth range, with the pocket knife being the most shallow at seven inches. I know there will be people who doubt my depth claims but so be it. 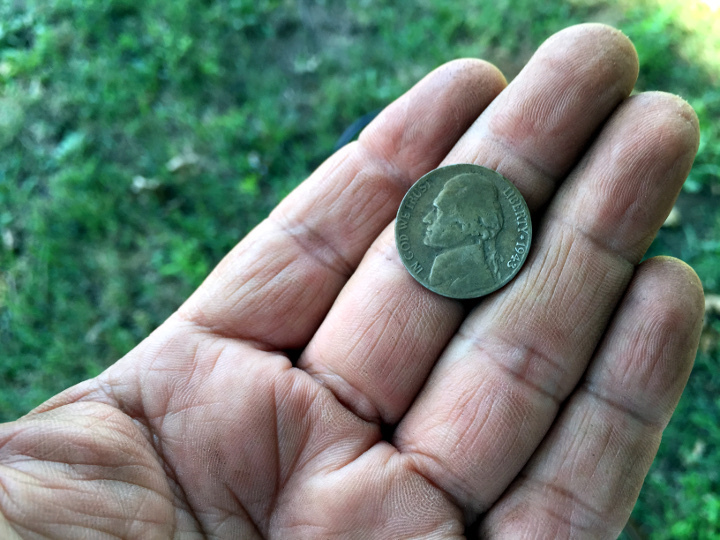 I am the only one interested in the depth of my coins as it allows me to gauge the capabilities of my machine in my Kansas soil. XP is working on an 11 inch coil and when I can buy it, I will own this park. Right now, the Deus comes with a 9 inch coil. Meanwhile, I am as giddy as a, well, let’s not be sexist here. Let’s just say I am super stoked. The only thing that will drive me to drink is the wheat to silver ratio at this park. I know the silver is down there; deep. I just need to figure out how to get to it.